News – What are Meltdown and Spectre? Meltdown applies to Intel and Apple processors and takes advantage of a privilege escalation flaw allowing kernel memory access from user space, meaning any secret a computer is protecting (even in the kernel) is available to any user able to execute code on the system. Spectre applies to Intel, Apple, ARM, and AMD processors and works by tricking processors into executing instructions they should not have been able to, granting access to sensitive information in other applications’ memory space. There are software patches for both vulnerabilities, but they’re more straightforward for Meltdown and more nuanced and difficult with Spectre. This means regular systems with multiple accounts, virtualisation environments, cloud, and yes—even just browsing the internet on a single-user system. Your risk will be different depending on the hardware platforms used, the operating systems running on those platforms, and your various patch levels at any given time, but the basic concept for these two attacks is that you should consider secrets to be attackable any place you’re allowing someone else’s code to run on an affected system. TL;DR: Both Meltdown and Spectre allow low-privilege users who execute code on your system to read sensitive information from memory via Speculative Execution. 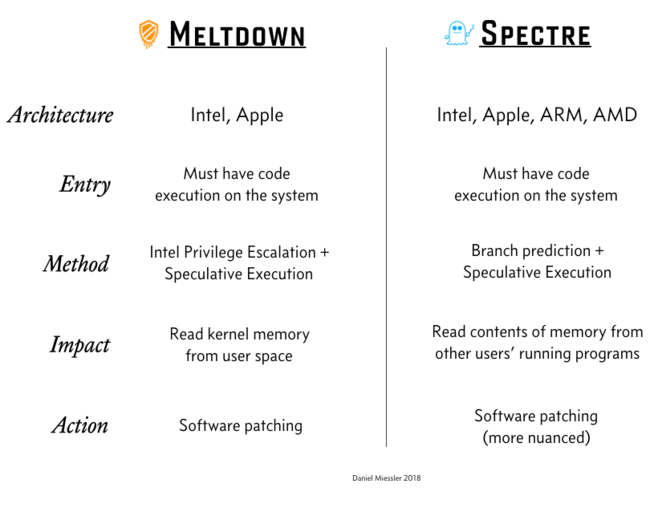 The difference is that Meltdown takes advantage of a specific Intel privilege escalation issue to do this, while Spectre uses the combination of Speculative Execution and Branch Prediction. Both issues can be addressed with software patches, but this is more effective for Meltdown than Spectre.